I don’t know about you guys, but I would love to just get away for a weekend! But since I can’t, SL is the next best thing. Especially with all the newness this weekend!! For Lazy Sunday today, you can stop over at Ingenue and pick up this really cute Little Angel t-shirt. It even has little wings drawn on the back. So precious! There are other designs and colors as well, so run over quickly! And of course a weekend isn’t complete without something new from Truth. The new Bree hair is gorgeous! A side swept long long ponytail, Truth is awesome and did both regular and split attachments. Of course, you might not need the split attachments if you use the new Hairy Situations long hair poses from Long Awkward Pose! More long hair poses, please!! Oh, do you like the house I’m standing in front of? You want to see more? For the Knitting Circle Bake Sale this weekend, you can get the My Getaway house from Funky Junk. It’s SO freaking cute! It’s tiny, just the perfect size for a cozy beach getaway. 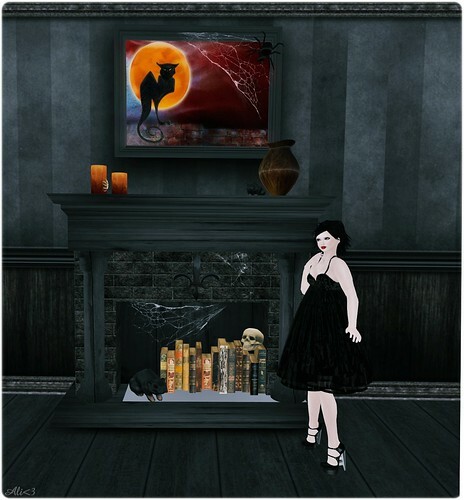 I’m showing the stilted version, which comes in at a small 83 prims. If you’re not one for stilts, the included non-stilted version is just 68 prims. It has a 7×13 footprint, so even a 512 parcel of land can carry it off. Buy it! I have to go hem pants. Jealous? I will admit, now that most of what I had to do this month is over, I’m getting wedding fever! And you know who else is getting wedding fever? Kouse Singh of Kouse’s Sanctum! She has a good reason, though. She’s getting married on July 16th!! YAY!! To celebrate this, she has a big big sale in the bridal department of her shop! Kouse really does amazing work, and even if you’re not getting married NOW, you should still go pick up some wedding gowns since they’re only $75L! Yes, that’s right! I’m wearing the Lynet gown in this photo, and it’s just so so pretty!! White is one of my favorite clothing colors to wear but it’s not always easy to find good crisp white in SL. Kouse is amazing with it, though! So please join me in saying a huge CONGRATULATIONS to Kouse on her upcoming marriage! And then YOU go to Kouse’s Sanctum and shop! Do you watch Grey’s Anatomy? Sometimes the girls [and guys] dance it out after an especially hard day. Just put on the music and DANCE. This is something I’ve done for years and I recommend it highly. If you head over to Belle Belle today, you can pick up something to help you dance it out, too! Belle Belle has been doing a Valentine’s week type thing and every day there’s something new for just $50L. I love a great deal, don’t you? 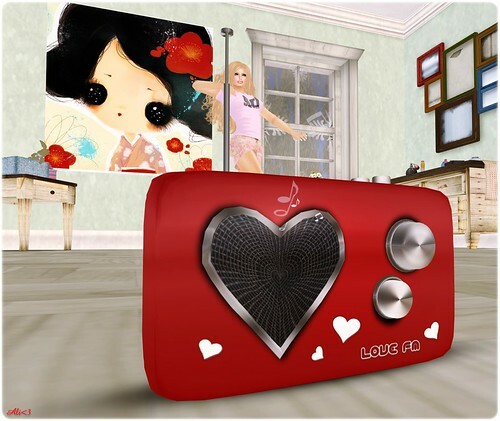 Today’s item is the Love FM radio, and oh, is it ever cute! It’s pre-programmed with several radio stations that you can listen to on your land, and of course if you have a favorite stream, you can add it to the radio. I had to deed it to my land group to get it to change my radio, but it was super easy. Once I got it set up, I was ready to dance it out! Head over to Belle Belle and get your radio. Even if you don’t use it for changing streams, it’s still cute for your home decorating! “Fashions, after all, are only induced epidemics." Oh hi! I hope everyone had a great weekend and holiday! There’s this little event going on called One Eleven. I know, right? Hardly anyone has talked about it. 😉 Check out my boots and hair from this event! At One Eleven, the designers have created one or more limited edition items. There are, you guessed it, just 111 copies of the items, and once they’re gone, they’re gone. This does mean that most of them cost quite a bit more than people come to expect since they are brand new items and will not be sold again. But I guess that’s the price you pay for limited editions. My horchata de amor, Sophia Harlow, treated me for my rezday and I was able to get these amazing Paperboy boots from Surf Couture and the Seasons hair from Elikatira. I’m in love with both!! There are a bunch of fab designers at One Eleven, so do yourself a favor and go check it out. Some items have already sold out, but there is still lots to buy! Whenever Ashoka Eales pops into my IM with, “Hey beautiful!” I always know something good is coming. But last night…sadness! Phoenix Rising is closing its doors! I am really down about it and keep hoping it’s not true. But, since it is, you can take advantage and hit up their 100L closing sale before the store is gone and pick up cute new things, like the Oda shirt and the Mona pants. This shirt is just so so lovely. I adore the big ruffled collar! The fit is just perfect, I didn’t have to adjust a single thing, which is usually not the case as far as prims go! I’m wearing it in black [hey, I’m in mourning!] but there are other colors available. The Mona pants are nice, basic pants with a button fly. There are also 3 styles of prim cuffs available, which is awesome for when you want a different look or want to wear them with different shoes. I’m wearing them in Grey, and there are other colors as well. Go hit up the sale and load up on goodies before Phoenix Rising closes. And let’s cross our fingers that this isn’t really a closing – it’s more of a “We’ll see you later” type of thing! Spruce Up Your Beach With Belle Belle! Calling all lifeguards! This month’s Spruce Up Your Space theme is “Beachy Keen,” and this weekend you can pick up this Naughty Lifeguard Tower from Belle Belle for just $150L!! The tower sits up to 10 avatars, and there are special couples animations, too! *wink wink nudge nudge* Hey, they don’t call it Naughty for nothing! The Naughty Lifeguard Tower is copy/no modify, and comes in at 178 prims. It’s a must for your summer beach! Go this weekend and get it at Belle Belle!